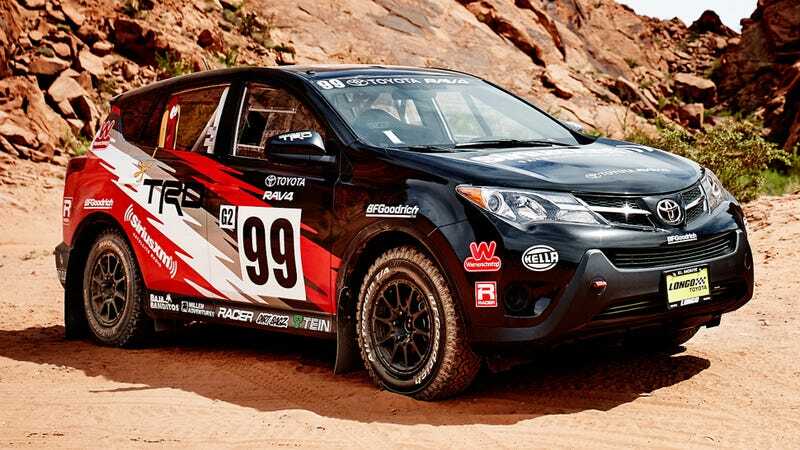 Toyota’s factory racing outfit is backing off-road pro Ryan Millen to take on Rally America’s open modified street car class in this basically stock 2015 Toyota RAV4 LE 2WD. I’m finding myself... genuinely curious about how well it does. The racing RAV4 makes the same 176-horsepower and 172-lb-ft of torque as your aunt’s grocery getter. Nothing’s been done to the engine or transmission, the SUV just gets a roll cage, road-legal BFGoodrich all-terrain 215/75R15 tires, Tein suspension all around, a bunch of stickers and a weight reduction of about 500 pounds. Also, there’s a terrified hot dog in the back seat. Unibody SUVs are not exactly common competitors in Rally America events, so this could be interesting to watch. Or it won’t, but there’s not much risk for Toyota either way. Either the RAV4 does well and it’s an awesome upset, or it doesn’t, nobody cares, and they get some great photos out of it to hang at Toyota dealerships. Millen’s RAV4 is scheduled to hit six races between now and the fall; the Idaho Rally - June 13-14, Mendocino Rally - July 18-19, Rally Utah - August 7-8, Gorman Ridge Rally - August 22, Prescott Rally - October 2-3, and the Mt. Hood Rally - October 17. If this ends up being fun to watch, somebody might have to get a small SUV series going. I’d totally watch this tangle with a jacked-up Juke and a Renegade with extra headlights!